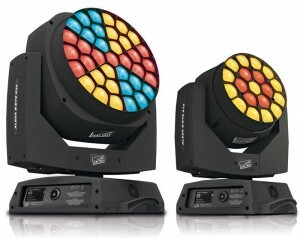 Greatest Clay Paky novelty of this year is A.LEDA B-EYE, a truly innovative concept and for its amazing features. The keywords describing A.LEDA B-EYE are: versatile and spectacular. A.LEDA B-EYE is versatile because it can be used in many diverse ways, even within the same project. In fact this fixture is, simultaneously, a state-of-the-art LED wash-light, an amazing "beam-light" and a projector for totally unseen, stunning graphic effects. First and foremost, A.LEDA B-EYE is a perfect wash-light, generating beautiful colours and featuring an impressive, wide 6° to 70° beam aperture. The zoom however can be closed even further, down to as little as 4 degrees, thus switching the light from a wash diffusion into a narrow and parallel beam. In this operating mode B-EYE becomes a "beam-light", whose beam consists of an array of nearly indiscernible, individually controllable small beams. As in the B-EYE, LEDs can be controlled one by one; the light beam is a pulsating bundle where every micro-beam has its own colour and shade. B-EYE finally introduces a totally unseen feature that turns it into a stunning effect light: the front lens can be rotated in either directions and at variable speed and many little beams are created, that can be unfolded or closed like petals. When colours and dynamic patterns are added, B-EYE generates countless kalei-doscopic projections, as no other LED fixture has ever done. For those applications where a simpler, yet powerful washlight is required, Clay Paky has developed a new fixture named A.LEDA CC (Colour Changer), featuring R-G-B-White colour mixing. When colour changing is not required, the new Clay Paky A.LEDA TW (Tuneable White) can be used, providing tuneable colour temperature through additive mixing, ranging from 2600 to 7500 K. Finally, for the simplest applications, Clay Paky has created A.LEDA W (White), a moving head LED flood-light generating a fixed 7500 K white light.